Maudie Palmer, Birrarung, 2016. Single channel video and surround sound (still), 4K video, 26 minutes, 37 seconds. Courtesy: the artist and MARS Gallery, Windsor. Birrarung is a filmic composition that follows the British-named Yarra from its source in country Victoria to the seaport of Melbourne. Conceived by Maudie Palmer and scored by Bryony Marks, the film uses moving image, still images, soundscape and text to celebrate the river as an inspiration for art and culture. 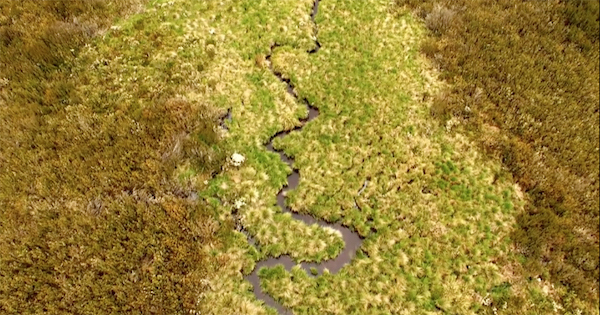 Known as the Birrarung to its traditional owners, the Wurundjeri People, the river begins in a closed catchment of mountain forest supplying fresh water to the people of Victoria. The river runs for 242 kilometres through an ancient valley, historically stripped of vegetation for timber and farming, without regard for the integrity of the river ecosystem. Viewers of the film are invited to meditate on the river’s life-giving properties, as it flows through natural and urban environments, a muse for creative responses that represent its subtle majesty and highlight threats posed by human indifference.